Google wants everyone to have the right information. Search is a natural action for most people connected to the internet today and Facebook and Amazon have to catch up with Google. Recently Google announced a new website Web.dev that gives you a rating for several factors that may affect the appearance of your website in search results. The tool is in beta so it needs work. Just tried Hubspot.com and there are the results. Google uses Lighthouse which according to Google "Lighthouse is an open-source, automated tool for improving the quality of web pages. You can run it against any web page, public or requiring authentication. It has audits for performance, accessibility, progressive web apps, and more." One thing to note here is that Lighthouse also checks for compatibility with Progressive Web Apps (PWA) which in my opinion is the future. Use this tool for your website and let us know how your website scores, specially in SEO. Among the deals this year for Black Friday, I noticed a Hulu deal, 99 cents a month for 12 months. The will get a good amount of sign-ups as this is good opportunity to checkout Hulu. I was a Hulu member when they first started and after the free version stopped, I stopped watching. Time to give Hulu a test again. You? Fast forward to 2005-2007 and meeting Jeff Barr an evangelist for Amazon Web Services and learning all about tech for startups. Amazon is now in a lot of places and businesses and being dominant may mean they have to split their Lines of business. Amazon with the addition of Whole Foods. The biggest section of Amazon that delights many of us is the Prime part of Amazon. Free shipping, free movies, offers, even a dedicated day for us. If Amazon needs to split here are my predictions. Business 2: Amazon Local/Go shop in brick and mortar stores and get delivery. 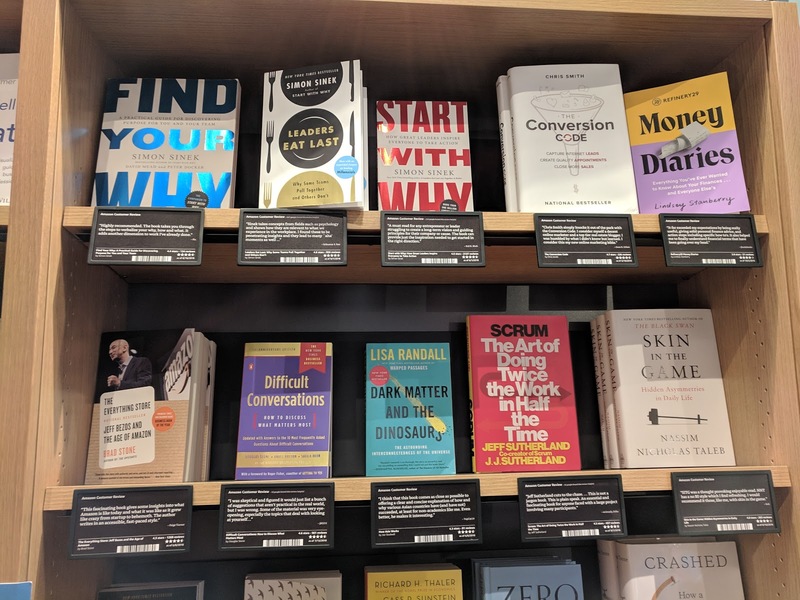 Amazon realizes that we want to touch, feel and try things and offline is important to online success. Business 3: Prime video and membership. Costco beware, the power of a membership is coming to take business away from you. Prime members can choose to shop online or get special privileges at the large Prime Stores. Business 4: Amazon Web Services. It is kind of already a different business. I think Jeff Bezos and Amazon do not want to be the monolith that the media and the stock market is making it to be. With Amazon split into 4 Jeff Bezos of course will be 4 times more valuable than today as all his 4 business will grow into monoliths and I will write another article in 5 years. Google is the World's Biggest Social Network! 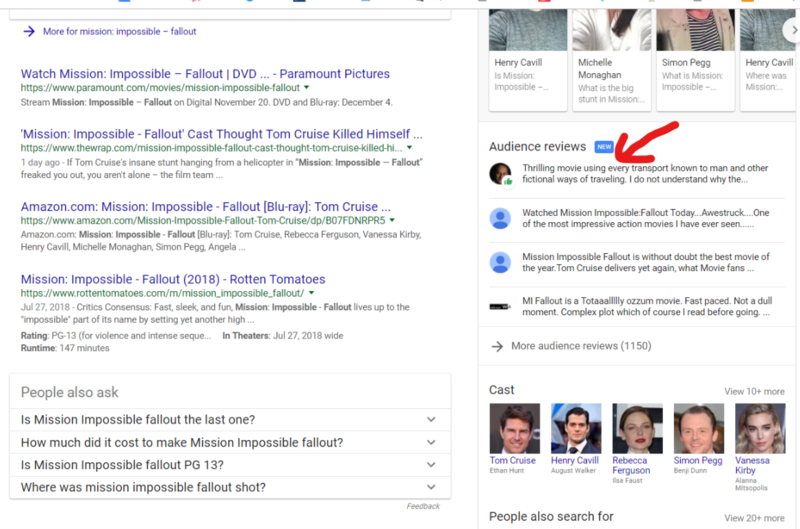 1) Commenting on Google Search: For a long time you could add your reviews/comments for Google search results like Movie and TV Show reviews. 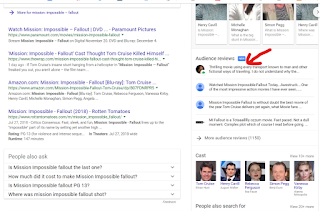 Now Google announced that you can start adding comments on Google Search results. Google says that "You can leave comments on things you’ve searched for on Google, like a sports game. You can also read and rate comments left by others." 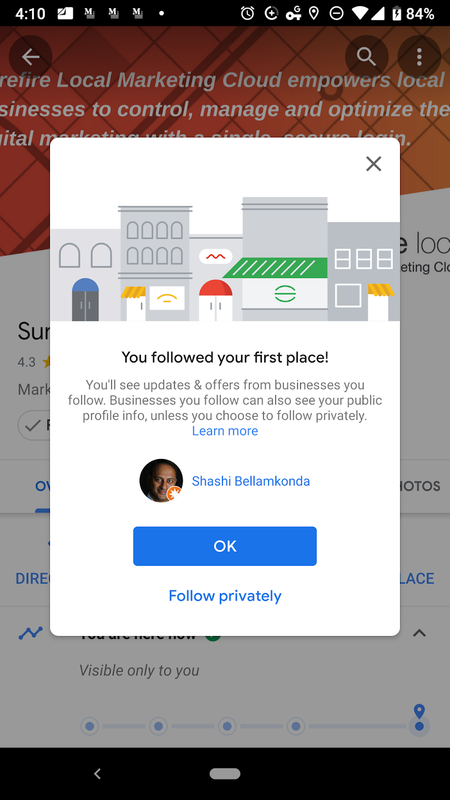 2) Google Maps becomes Social: You can now follow and even send a message from Google Maps to a business. 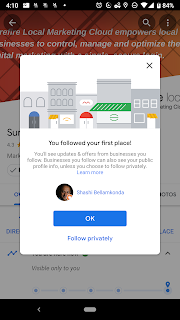 Once you a follow a business on Google Maps, the business can send you offers and updates so you don't miss cool happenings. 5) Twitter Results in Google Search: If you have built your website with structured data/schema and have associated your social properties with your website, it is easy for Google to associate the business social profiles to your Google search results. Your latest 3 tweets appear directly in the Google search results for your business. The Facebook Portal Plus at the Amazon Store. It's Huge! We have been planning to visit the Amazon Store ever since one was opened in Georgetown, Washington DC and later at the Bethesda Row in Maryland. 1) Stuffed Like A Warehouse: In my opinion this store is stuffed probably like the Amazon Warehouses. It seems like everything is all over and you just have to explore and find what you need. Definitely the Amazon Logistics division planned the store and not the wonderful customer experience team at Amazon. 2) Has a Children's Section: Till my kids grew past the kid's section, the Barnes and Noble Children's section was an enchanting place. Amazon has a children's section as well. 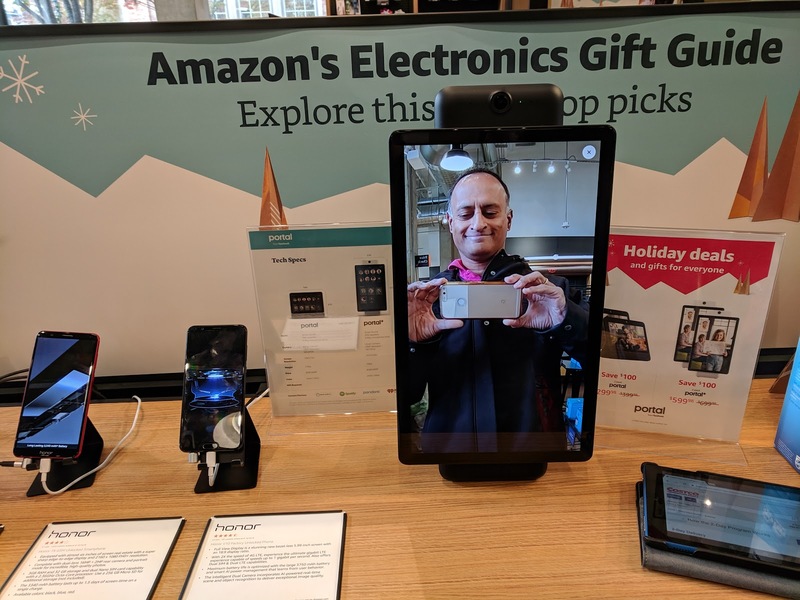 3) Check Out the Facebook Portal Devices Here: Amazon Books has all varieties of Amazon devices and smart bulbs, such as Amazon basics. Surprised to see Facebook's Portal+ and play with it. The version shown in the photo above is huge. I would have loved to have this as a conference speaker for work but not for something I want to share with Facebook friends. If they can have the Facebook portal, why not the Google Home Hub or Lenovo Google Smart Display? Looking for Apple devices, just walk across the street to the Apple Store. 4) Best Buy Style Games : My son was very happy to use the wireless game controllers while using the Amazon Fire TV to play games. That is something I had not known that an Amazon Fire TV stick or cube could do. 5) Amazon Basics: If I had bought one thing today, it would have been the Amazon Basics stuff. USB-C cables, AA Batteries $8+ for 20 or iPhone Chargers all at the bargain Amazon prices. If there was a Amazon store on every street corner, you probably would go there. I needed AA batteries but I am going to buy them either from Costco or from Amazon online. 6) No Trade-in of Amazon Tablets: One of the prime reasons I was here was hoping to avail of Amazon's Device Trade-In to upgrade my Kindle Fire 8 to a Kindle Fire 10. 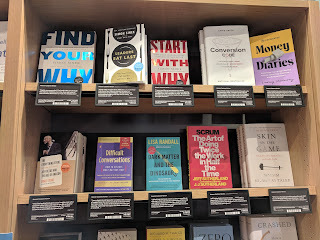 Unfortunately Amazon Books is not the place to do this and I would have to go to Tyson's Corner. Why? 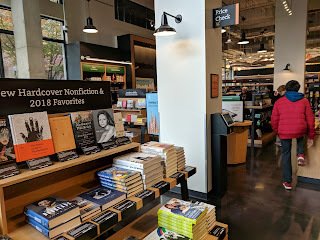 7) No Coffee: I thought all the Amazon Books Stores had a cafe. Not true. Only the Georgetown store has Allegro coffee. Not the Bethesda store. No worries get the locally grounded Quartermaine coffee a few doors down. Ok, while you can pay with your Amazon App, the store has a cashier line and check out counter. IMHO it is lacking in technology and I would rate it a 3.5 star out of 5 stars. Amazon needs to think customer service if they want offline stores. Not sure is I would go back to this store unless it was closer than the Best Buy or Home Depot and I needed something urgently.